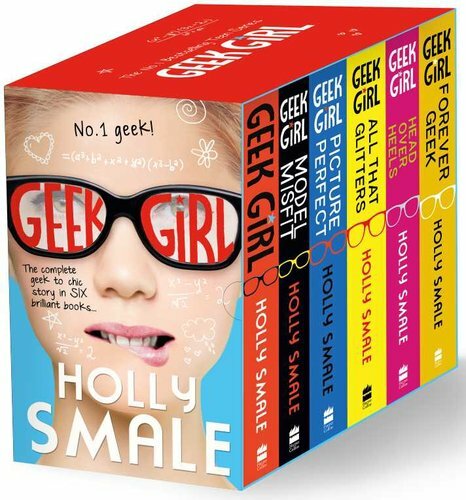 Partly inspired by her own experiences growing up in the fashion industry, former model Holly Smale's Geek Girl is a bestselling and award-winning series that will appeal to any child who is a proud geek that also appreciates the glitzier side of life. Harriet Manners is the font of all knowledge when it comes to facts. She knows a cat has 32 muscles in each ear and that the average person laughs 15 times a day, but boys remain a mystery. When she's spotted by a top modelling agent, her world is turned upside down. She believes this could be the start of something special, but her eyes are opened by just how cruel the fashion industry can be... Will she be able to hold everything together and stay true to herself? Funny, feisty, smart and sassy, this collection of books has a strong message at its heart and is very entertaining. Harriet Manners knows that a cat has 32 muscles in each ear, a "jiffy" lasts 1/100th of a second, and the average person laughs 15 times per day. She knows that bats always turn left when exiting a cave and that peanuts are one of the ingredients of dynamite. But she doesn't know why nobody at school seems to like her. So when Harriet is spotted by a top model agent, she grabs the chance to reinvent herself. Even if it means stealing her best friend's dream, incurring the wrath of her arch enemy Alexa, and repeatedly humiliating herself in front of impossibly handsome model Nick. Even if it means lying to the people she loves. Veering from one couture disaster to the next with the help of her overly enthusiastic father and her uber-geeky stalker, Toby, Harriet begins to realise that the world of fashion doesn't seem to like her any more than the real world did. As her old life starts to fall apart, will Harriet be able to transform herself before she ruins everything? Harriet Manners knows a lot of facts. She knows that humans have 70,000 thoughts per day. She knows that Geek + Model = a whole new set of graffiti on your belongings. And that the average person eats a ton of food a year, though her pregnant stepmother is doing her best to beat this. But Harriet doesn't know where she's going to fit in once the new baby arrives. And with her summer plans ruined, modelling in Japan seems the perfect chance to get away. Can Harriet cope with the craziness of Tokyo, her competitive model flatmates and her errant grandmother's `chaperoning'. Or seeing gorgeous Nick everywhere she goes? Will geek girl find her place on the other side of the world? Harriet Manners knows more facts than most. She knows that New York is the most populous city in the United States. She knows that its official motto is `Ever Upward'. She knows that one in thirty-eight people living in the US lives there. But she knows nothing whatsoever about modelling in the Big Apple and how her family will cope with life stateside. Or `becoming a brand' as the models in New York say. And even more importantly, what to do when the big romantic gestures aren't coming your way from your boyfriend... Does geek girl go too far this time? arriet Manners knows many things. She knows that toilet roll was invented by the Chinese in 600 AD. She knows that a comet's tail always points away from the sun. And she knows that the average healthy heart beats 70 times per minute. Even when it's broken. But she knows nothing about making new friends at Sixth Form. Or why even her old friends seem to be avoiding her. And she knows even less about being a glittering supermodel success. Which she now is - apparently. Has Harriet's time to shine like a star finally arrived, or is she about to crash and burn? Harriet Manners knows almost every fact there is. She knows duck-billed platypuses don't have stomachs. She knows that fourteen squirrels were once detained as spies. She knows that both chess and snakes and ladders were invented in the same country. And for once, Harriet knows exactly how her life should go. She's got it ALL planned out. So her friends seem less than happy, Harriet is determined to Make Things Happen! If only everyone else would stick to the script... But is following the rules going to break hearts for GEEK GIRL?